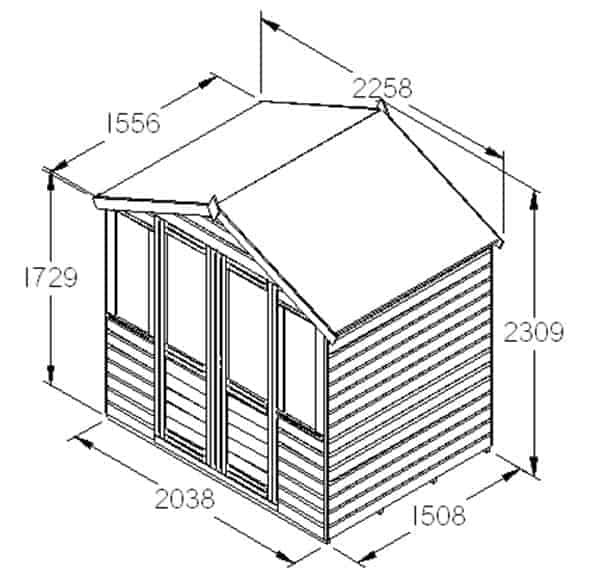 Even the more modestly sized gardens are going to be able to enjoy the Hartwood 7′ x 5′ FSC Ilmington Summerhouse. 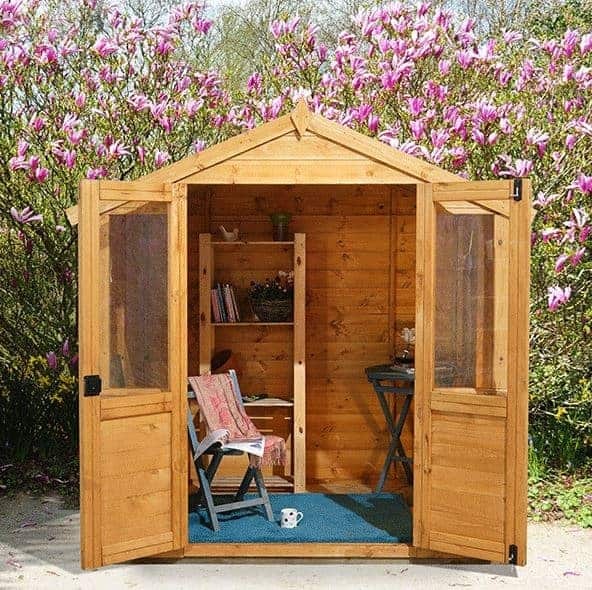 This is one of the more charming and compact summerhouse that you can buy. With its silky smooth cladding and large double doors, it is almost like every time you see it, it is trying to seduce you into coming inside for a relaxing sit down and drink so you can watch the world go by. Even though it is not overly large, you still have plenty of space to put in a chair, table, shelving and other little items that are going to make this a place you love to come and unwind in. The lovely looking cladding that is used is actually tongue and groove shiplap cladding and it is incredibly strong as it is an impressive, 12 mm. Ensuring the summerhouse is going to stand strong for many years is one very sturdy frame. In general, despite its very friendly, easy going and charming good looks. This is actually one of the stronger compact sized summerhouse you can get. Its impressive strength goes all the way to the bottom where a strong flooring made from solid sheet boarding and well spaced out floor joists will be able to take the weight of many different items. 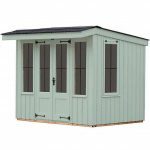 The Hartwood 7′ x 5′ FSC Ilmington Summerhouse is one very impressive summerhouse that while 7 feet 5 inches wide and 5 feet 2 inches deep, actually offers you far more space than you would think without taking over your garden. We can just picture you now. Drink in your hand, radio on, good book in other hand and the kids or your other half nowhere to be found. This is your own little slice of heaven and we are sure you are going to love it. When you are inside the summerhouse you are going to be shocked at how high it is, the ridge height is over 7 feet high and even the eaves at 5 feet 9 inches is rather impressive. The high roof is actually very well made and is going to prevent rain from not just sitting on top of the summerhouse, but due to the apex nature of the roof it is always going to run off at the sides. Sand felt is what is used to cover the solid sheet boarding and to be honest with you this is a fine combination. The 12 mm thick tongue and groove shiplap cladding is going to keep the rain out very well and it makes the summerhouse on every strong structure, but it is also just so nice to look at. The cladding makes this be just so eye catching that when you are outside doing a little garden work you are always going to be tempted to just thrown down the gloves, toss the hoe over your shoulder and go relax in here. The framing is just as impressive as the cladding. At 35 mm x 28 mm this frame is going to really make sure the summerhouse stays standing strong for well over 20 years. 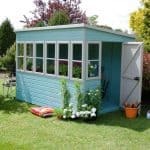 It also makes it a summerhouse that can handle the rough and tumble from kids so even for families this would make for a great little summerhouse. It is not just the solid sheet boarding comprised floor that is going to make it so you can place many heavy items inside the summerhouse. They have also been very smart with the floor joists that they have used as well. All in all while it may not be the prettiest flooring, solid sheet boarding is still is very strong and it does help make this be the affordable summerhouse that it is. Still, as you can see from the pictures, a little rug or piece of carpet can really make that floor look great. 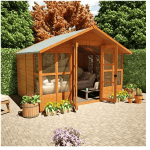 The Hartwood 7′ x 5′ FSC Ilmington Summerhouse really is one smart looking summerhouse and to keep it that way, you will need to give it a coating of wood treatment once you have installed it. Within a week or two is always the best so try not to keep putting it off until next weekend. Treatment is not just a one time thing and to make sure the summerhouse has a rot free life, you will have to treat the wood once a year. 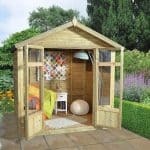 The ten year anti rot guarantee that they offer with this summerhouse is only valid as long as you treat the wood. Even though this is not one of the larger summerhouses, they have still managed to use these awesome double doors. When both doors are open there is 3 feet 8 inches of width and 7 feet 4 inches of height so you can open them up to let in a nice breeze. Also, it makes getting your furniture in so much easier which is something that you will be very thankful for. The hinges used are high quality so you will have no issues with the doors starting to sag as the years go by. There are only two windows, made from shatterproof styrene, which are on the doors, but these are some very large windows so you are going to get plenty of light in the summerhouse. One extra window on the side which could be opened would have been something that we would have liked to have seen, but with this being the price it is, we do understand why they did not. Those double doors can be locked with a fantastic little press lock which is very easy to use and it saves you from having to purchase or add some other kind of locking mechanism or even having to pay for an armed guard to stand watch while you are sleeping or out of town. We feel that even though the windows on the doors are on the large size, you do actually get a fair bit of privacy with this summerhouse as there are no windows on the sides or back. Adding blinds or even something as cheap as fabric to the windows would help keep your items hidden when you are not using the summerhouse. There are actually no customisation options offered with this summerhouse and that is fine by us as it looks great the way it is. The fun to be had here is laying out the inside with your furniture and little knick knacks that are going to really make this place your own. 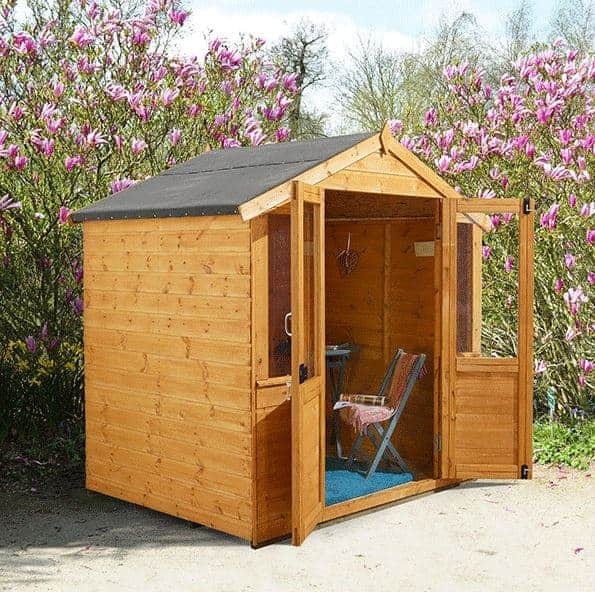 For £119.99, you can add a Ecobase Plastic Shed Base which will give the floor some extra support and also come in handy if you are installing the summerhouse on grass. While this is a very practical extra, due to its rather high price we would suggest you have a long hard think about if you actually need it before you pull the trigger on it. 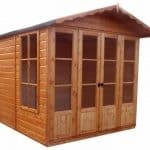 With its strong frame and tongue and groove cladding this is one very high quality summerhouse, which is quite remarkable considering the affordable price. The materials used are going to last for a very long time and apart from the annual coating of wood treatment they do not require a whole lot of TLC either. 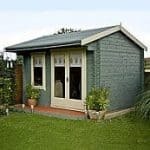 This is slightly larger than some of the other compact sized summerhouse we have seen and the space inside that it offers can actually go very far if you plan your layout well. We are sure that many people are going to be pleasantly surprised at how many things they can fit inside here. As long as the person helping you is not too grouchy, then this should be a rather straightforward and pleasant experience. Even those with modest DIY skills will not have any issues putting this together. We feel that the asking price for this is very fair and that with the cladding and that strong frame, you are getting excellent value for your money here. Final Thoughts: The Hartwood 7' x 5' FSC Ilmington Summerhouse is one lovely looking summerhouse that really did impress us from the first moment we saw it. 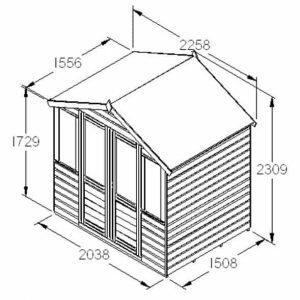 While it is not one of the larger summerhouses, you still will be able to fit plenty of things inside it and really make this your own. The way they have managed to keep the price so reasonable, but have 12 mm tongue and groove shiplap cladding and such a robust frame is very impressive and makes this one fantastic deal. This is the summerhouse for you if you want something that is not going to take up a lot of space, but still give you a decent amount of room to play with, oh and as you have already probably realised it looks gorgeous as well.